To the left we have our top three ladies from the Providence Pageant, these ladies advance to the finals for the 2010 title pageant, and they also rock! 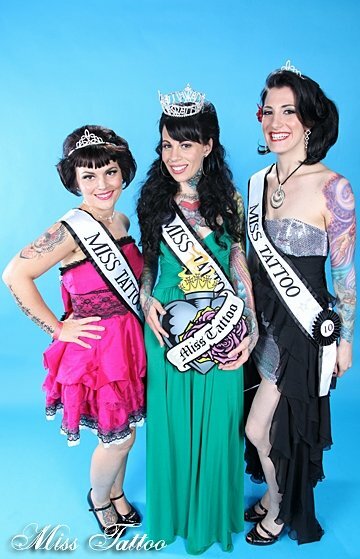 We have (starting at the left) Angelique Price 2nd runner up, Jennifer Pantuosco Crowned Overall Winner, and then the lovely Rebecca Lore our first runner up. These women are excellent examples of Miss Tattoo material. And I couldn’t be happier with the results. They worked their asses off to be the “best” the could all weekend, and the hard work paid off as they all captured crowns and tiaras. Angelique is a tattoo artist, a mother, and a wife. Rebecca is a lighting professional for music productions. And Jennifer is a professional Nanny, mommy to a cute french bulldog, a wife, and an avid equestrian. Look for the Wild Card Winners in the next post. Until the next pageant, keep it pretty!